The following contractual clauses have been drawn up according to the demands in good faith. If you wish to make an enquiry about the content, interpretation or modification of this contract, you can get in contact with me by e-mail on the address of info@hotelmeninas.com. The clauses relating to the main object of the contract, price and service expense or anything relating to the goods and services offered cannot be altered or modified. The fast acceptance of the Online Reservation contracting conditions will take place by pressing the CONFIRM button, and it presumes the full acceptance, without reservation to the issued version of the contracting conditions at the time of making the reservation and contracting process. For such a motive, the user must read the conditions attentively, as without previous acceptance of the conditions, you will not be able to carry out the reservation. The users are forced to use the Online Reservation contracting service as the law and the reservation service contracting conditions determine. Also, they have to use it according to the public order rules, in a moral and proper manner. The company Ramón Carús y Cia. S.A. will be able to deny access to the web page if the user does not comply with these conditions. The company Ramón Carús y Cia. S.A. , guarantees the confidentiality of the personal data and it will comply with the Spanish rule in relation to the third party personal data protection. The user knows and accepts, agreement with that established in the Organic Law 15/1999 of 13th December, about Personal Character Data Protection and their development guidelines in which their personal details will be incorporated into their own Ramón Carús y Cia. S.A. file, ending in proceeding to the sought after reservation and carrying out product offers and personalized services, so to improve the relation with their clients. The user has the right to access, correction, cancellation and opposition of their personal character details by sending an e-mail to info@hotelmeninas.com. Ramón Carús y Cia. S.A. does not take responsibility for the possible errors or deficiency of security that could happen due to using, by the user, of an insecure or non-updated internet browser. It does not force to control and it does not control previously the absence of a virus or controlled elements that could produce an alteration of the users software or hardware or people that visit the pages, through not responding to the damages of whatever nature they could be derived. 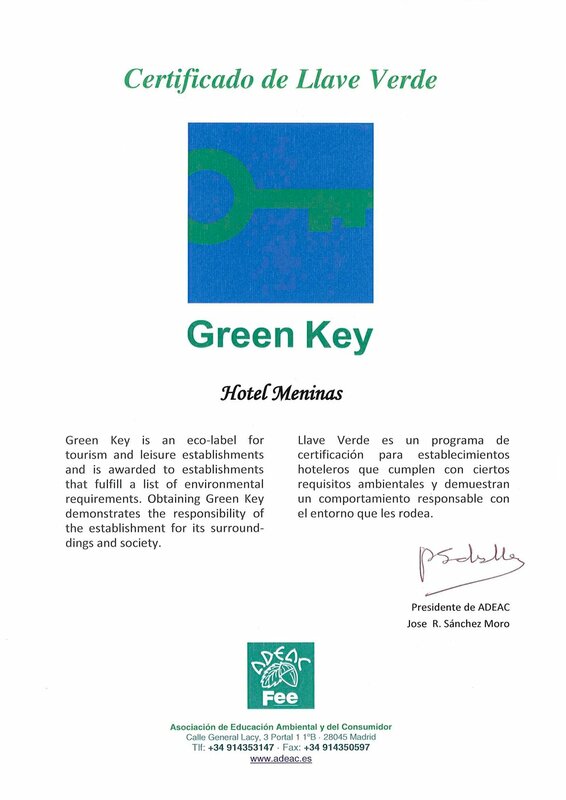 All the information contained in the web page www.hotelmeninas.com is protected by the rights of the author or other protection rights of the intellectual owner, which belongs exclusively to Ramón Carús y Cia. S.A.
Reservations must be guaranteed with a valid credit card number. Reservations may be cancelled only by fax or by e-mail or or through the web page. To be able to cancel your reservation on www.hotelmeninas.com you must keep your reference number, as you will need it to be able to access the reservation within the time limits. The cancellation of the bookings can be done without any charge if the cancellation is done minimum 48 hours before the day of arrival of the customers at the hotel, except in case of other cancellation policy indicated in the conditions of a package or special offer booked. Early departures have to be communicated at the Reception at least one (1) day .If the reservation is cancelled out of this period, or, in the case of a no show, (failure of the guest to show up at the otel on the date of arrival according to the reservation), Ramón Carús y Cia. S.A. (holder of the hotel) shall be entitled to charge one (1) night stay to the credit card identified in the reservation in accordance with the price and taxes agreed to, for cost of cancellation and as compensation for damages . Likewise Ramón Carús y Cia. S.A. (holder of the hotel) reserves the right to charge to the credit card supplied in the reservation any services consumed by the guest during his/her stay at the hotel which were not paid for upon the guest departure. All bookings of 5 or more rooms that are made under the same name, are considered as a GROUP booking. Thus the hotel may process them as a GROUP booking. The department in charge of them, whitin the company Ramón Carús y Cía, S.A., will contact the client to verify the information and to process the payment of the GROUP booking. The total amount of the reservation considered as a GROUP booking will be charged to the credit card once the reservation is completed. This reservation does not admit any cancellation or change under any circumstances. The company Ramón Carús y Cía, S.A. may use the credit card provided as a guarantee of the reservation, to process the payment of the booking. If the credit card is not valid, the company Ramón Carús y Cía, S.A. will cancel the reservation automatically. The packages reservations and also the packages of: Sung Christmas, Sung End of Year, Sung Madrid and others, will have to be made writing, payin a 100% of the total amount at the confirmation moment. Cancellations of packages reservations with closed price are not allowed. If you want to modify your reservation, you can do it directly on the web www.hotelmeninas.com by introducing your booking reference, which was given to you at the time of confirming the reservation, or you can also contact us at the hotel dialing the telephone number+ 34 91 541 28 05. Once the reservation has been modified the services and conditions applie will be those done in the last modification. If the company Ramón Carús y Cia. S.A. cannot carry out the contracted services in the agreed conditions, Ramón Carús y Cia. S.A. is obliged to provide the user with accommodation in another establishment of similar characteristics as compensation for damages. Both parties are obliged to not claim any other quantity derived from the damages caused in the case of anticipated cancellation by the user and by the impossibility of providing rooms and the contracted service on behalf of Ramón Carús y Cia. S.A.
All of the service prices or offers included in the web page, will only be valid for the time that they are accessible to the user of the Online Reservation Service, for their effective contracting. Once the reservation is carried out through the system and accepted by the user, he must print out the reservation confirmation that will act as proof of the contracted services and reservation. In the case of not presenting this confirmation to the reception on arriving at the hotel, the hotel will not respond to any error related with the reservation. The confirmation will consist of all the data reservation, such as arrival date, leaving date, rooms and contracted services, number of people, reservation price and the other data needed for the reservation, which will contract the parties. The contract request or complementary reservation services not included on the Online Reservation System, will be made directly by the user in their hotel. If one or several of the included clauses in the general contracting conditions of the Online Reservation System is declared Null, in part or total form, or inefficient, this will affect only and exclusively the arrangement, supporting all the others in the same terms and generating the same obligations. The reservation request of a cot or an extra bed is subject to availability by the hotel chosen , who shall , within a period not exceeding 24 hours communicate your if your request can be confirmed, stating the extra cost if any . Until then your booking will be confirmed based on the type of room chosen, until the availability or not of an extra bed is confirmed. The request for hiring or booking additional services not included in the Online Reservation System will be held directly by the user in the hotel. If one or several of the clauses included in the general terms and conditions of the Online Reservation System is declared invalid in whole or in part , or ineffectiv , it will affect only and exclusively to that provision, other things being in the same terms and generating the same obligations. These Rules and Clauses of Use are subject to Spanish Law. For the resolution of any disagreement that may arise with respect to the total or partial validity, execution, compliance or resolution, the user and RAMÓN CARÚS Y CIA. S.A. are subject to the Courts and Tribunals of the Madrid Capital, with express renouncement of their own jurisdiction or any other that, when appropriate, could correspond to them. Being of the legal age according to the current legislation of their nationality, having full legal and working capacity, sufficient to enter into this contract and reservation. He/she declares that the user has understood the procedure of the Online Reservation system and the General Conditions of the Online Reservation Contracting Service, all of which form an integral part of the contract. The user declares that all the data provided to Ramón Carús y Cia. S.A., included the relative information of the credit card to carry out the reservation and contract are true, and acts as first person and not through third parties. The reservation remains confirmed and guaranteed with the credit card used in the procedure of making the reservation. The credit card information is taken as a reservation guarantee. However, the user authorises Ramón Carús y Cia. S.A. to make collection for cancellation costs from the credit card that corresponds to the Cancellation Politics section.